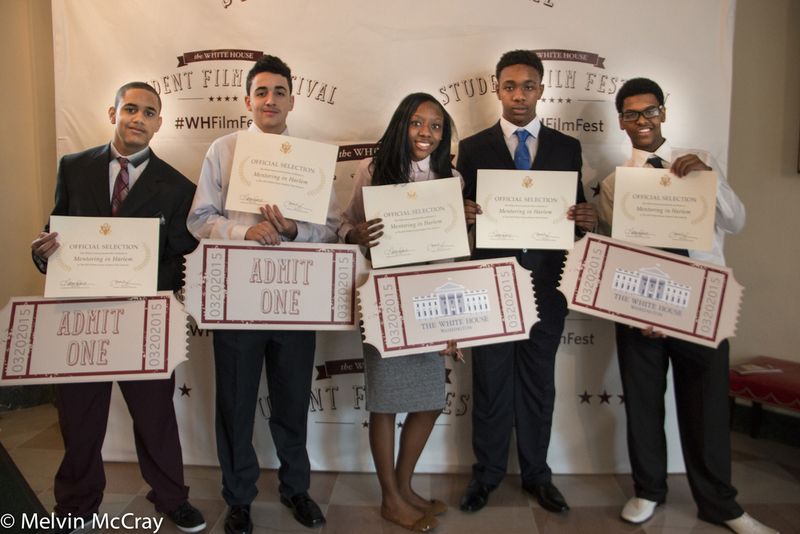 These students from the Digital Media Training Program in Harlem were among 15 winners of the 2nd Annual White House Student Film Festival. Image © Melvin McCray. Harlem’s own Digital Media Training Program (DMTP)—fresh off the White House Student Film Festival awards ceremony—now collaborates with the inspiring, educating and empowering Young Photographers Alliance (YPA) to create media projects using photography to inspire and to train young adults. In collaboration with seasoned photography professionals, dedicated teachers and 21st-century digital technologists, the two organizations in tandem are delighted to announce their nonprofit educational initiative, “A Thousand Young Photographers” (ATYP). A time-honored maxim holds that a picture is worth a thousand words. In kind, DMTP and YPA intend to train a thousand young photographers—to put a camera in the hands of each and every one of them. If children can frame their world anew, it will change their lives forever. Each new photograph a child takes allows him or her to envision the world with fresh eyes—the eyes of a photographer. Every new photograph a child takes imbues a growing instinct of finding beauty in the midst of ugliness, hope where there is despair, and artistic expression across even mundane vistas. Within each reframing, a thousand photographs taken will develop a profoundly changed child. Multiply this by a thousand children, and you have a changed world! “In short, we fully intend to invigorate profound world change—by developing and skillfully refining a child’s ability to perceive it—one thousand children at a time,” says DMTP founder Melvin McCray. DMTP and YPA fit seamlessly together for this effort. Both are community-based, nonprofit organizations that promote youth empowerment using various forms of media—including photography, film and 3-D animation. Were this joint initiative not exciting enough on its own merit, highly respected organizations are now lining up to become part of the action. Currently, four well-respected institutions have committed to underwrite this initiative: Boys and Girls Club of Harlem, the NYC Mission Society Grant Cornerstone Program, The Barnard College Science and Technology Entry Program (STEP), and the West Harlem Group Assistance Technology Hub. Jerry Tavin and Deborah Free wanted to help build the next pipeline of image originators; they founded YPA in New York City in 2009. Created to inspire, empower, educate and mentor the next generation of image creators, YPA commits to sharing knowledge by offering tangible, real-world support under various relationship modes of development, professional mentorships, confidence building, access to industry leaders—and through financial assistance—to members around the world. YPA holds a unique focus on photographic community; it fosters a direct, meaningful nexus between both emerging and established photographers. They envision creating powerful synergies between the two groups—recognizing that collaboration benefits each—ultimately energizing and advancing the profession as a whole. YPA has been endorsed by the American Society of Media Photographers (ASMP) and has paired 300 young photographers with more than 120 national and international mentors. DMTP conceptualized a joint mission: to train underserved Harlem youth within the areas of video, photography journalism, 3-D animation and engineering; and to chronicle the rich history of the Harlem community. Their program has since expanded to include engineering and 3-D printing. DMTP operates under the auspices of the Board for the Education of People of African Ancestry, a Harlem-based 501(c)(3). The program receives financial support from the West Harlem Development Corporation as part of an agreement between Columbia University and Community District 9. Founded in 2013 by Melvin McCray, DMTP was recently honored by U.S. President Barack Obama during a White House screening and reception. Mentoring in Harlem, a DMTP award-winning student film, was created under the guidance and supervision of McCray. An award-winning former editor of ABC’s World News Tonight with Peter Jennings, McCray is an adjunct professor at Columbia University’s Graduate School of Journalism. For more information, please visit the YPA website, and the DMTP website or contact Melvin McCray by email to melvinmccray@gmail.com or phone (917) 748-4122.